A pivotal role player in London’s broken-beat and nu-jazz scenes, DJ/Producer Dominic Stanton, more widely known as Domu, surprised many in late 2009 when he announced his retirement from music. (Read his full blog entry here). Stanton terminated his website, social network accounts and his start-up label, Treble-O, immediately after his announcement. Whether or not he’s out for good is unsure, but it's been nearly two years of silence. With more than a decade worth of releases, Stanton recorded under a slew of aliases including: Umod, Bakura, Yotoko, Rima, Zoltar, Blue Monkeys and Realside. Among the collection of labels he’s record for, his most recognized work may be his early Drum and Bass material on 4Hero’s legendary Reinforced Records, under Sonar Circle. From hip-hop, jungle, house and all things electronic, you could always expect polished, hard hitting drums and club ready tracks from Stanton. The soul element, always involved. At the end of the day, there's no question he'll go down as one of our modern electronic legends. 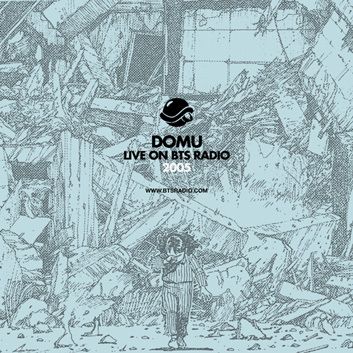 Andrew connected with Domu for this 2005 broadcast which has never before been available for download.